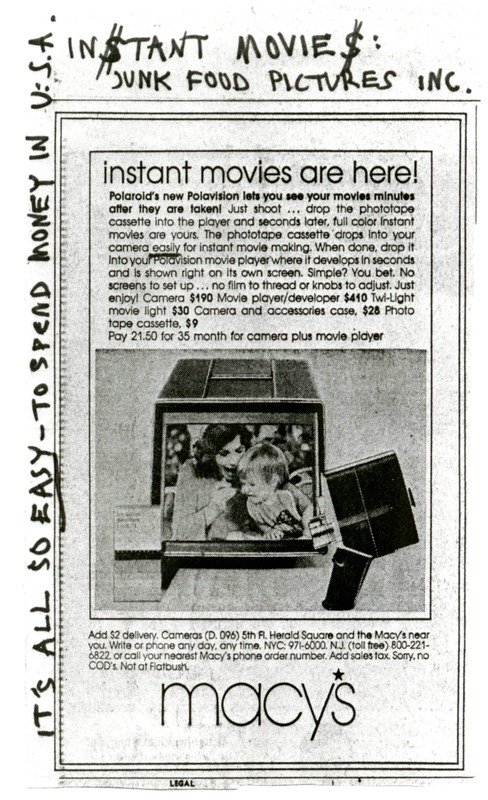 In 1977, at the dawn of the home video era, the Polaroid Corporation introduced Polavision, a proprietary film format and apparatus promising instant development and playback. Amateur filmmakers could shoot 150 seconds of silent color film on a cartridge and watch it only 90 seconds later on a small rear-projection screen. The system was a devastating commercial failure and caused major financial losses for the corporation before its discontinuation in 1980, but in its brief life was used by prominent figures such as Stan Brakhage, Charles and Ray Eames, Robert Gardner, Morgan Fisher, and Andy Warhol. Polavision was a social medium avant la lettre in that it was a system grounded in prosumer activity, relationality, and feedback rather than in the quality of the films it yielded. And yet, this emphasis ran up against significant limitations: Polavision produced unique cassettes unable to be copied or shown on other film systems, thus severely circumscribing its social ambit and localizing it within a private realm that Polaroid marketing clearly delineated as a suburban idyll of reproductive heterosexuality. Artists, meanwhile, would turn to the system for very different uses. This illustrated talk will recount the curious episode of Polavision’s instant movies, finding in it a way of questioning the idea of the medium of film as a unified object. Erika Balsom is a senior lecturer in Film Studies and Liberal Arts at King’s College London and the author of After Uniqueness: A History of Film and Video Art in Circulation (2017) and Exhibiting Cinema in Contemporary Art (2013); the co-editor of Documentary Across Disciplines (2016); and a frequent contributor to magazines such as Artforum, frieze, and Sight & Sound. Tickets - Pay-what-you-wish, available at door ($8 suggested donation). Above: Polavision clipping sent from Kenneth Anger to Stan Brakhage.